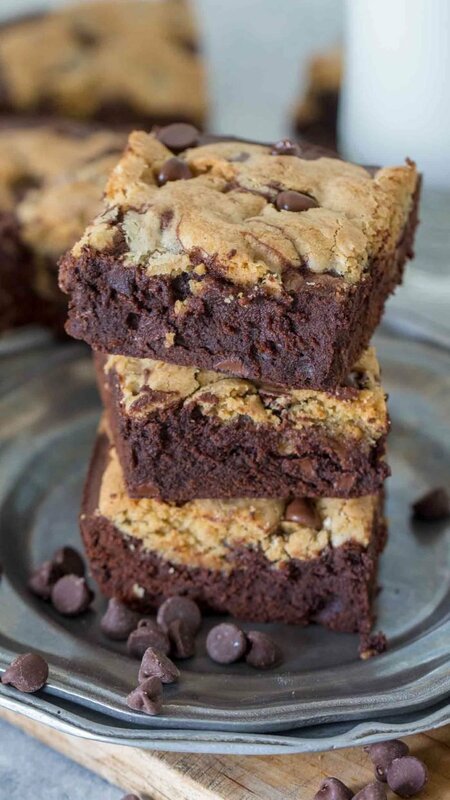 Brookies Bars are a delicious and sinful combination of gooey, chocolaty brownies topped with a buttery chocolate chip layer. Why give up one favorite, when you can enjoy both! 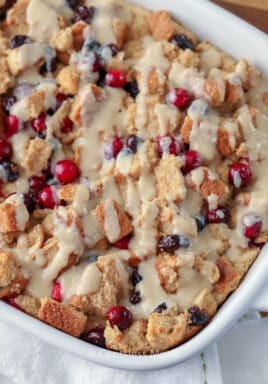 Pin it to your DESSERTS BOARD to save it for later! 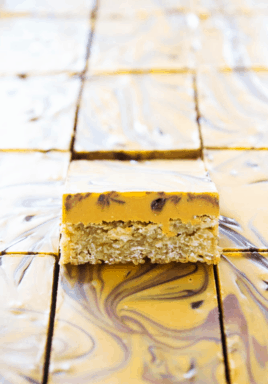 Brookies Bars are the perfect dessert for chocolate lovers, who also have a soft spot for buttery, melt in your mouth chocolate chip cookies. The great thing about Brookies is that you don’t have to choose between a brownie and a chocolate chip cookie. I mean, why in the world do you have to face such a hard decision?!! Problem solved, you can combine both and experience a chocolate overload with each and every bite. 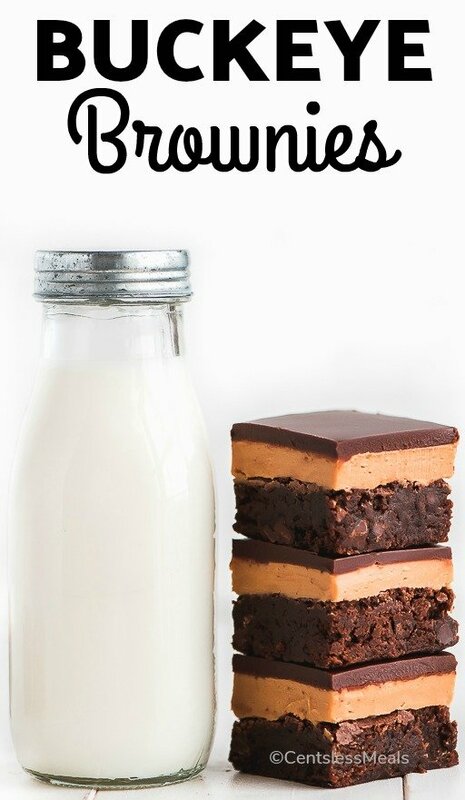 This dessert is amazing and also incredibly easy to make! 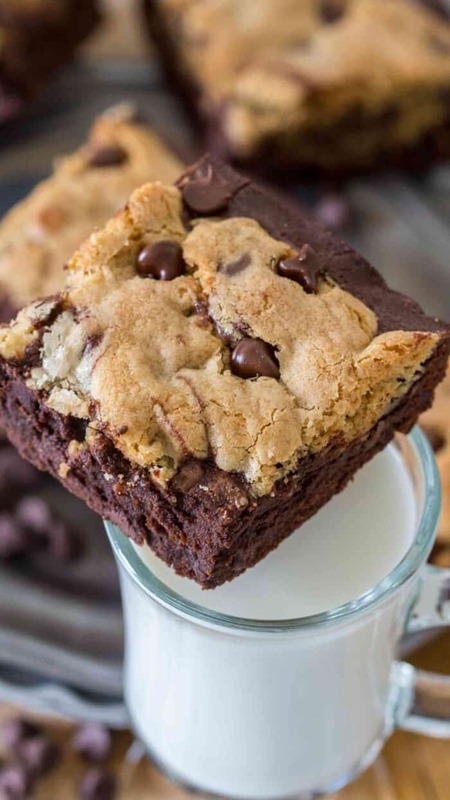 I should add that serving a pan of rich, chocolaty brownies topped with a layer of buttery and gooey chocolate chip cookies will make you new friends instantly and most likely you will become the queen of any party. 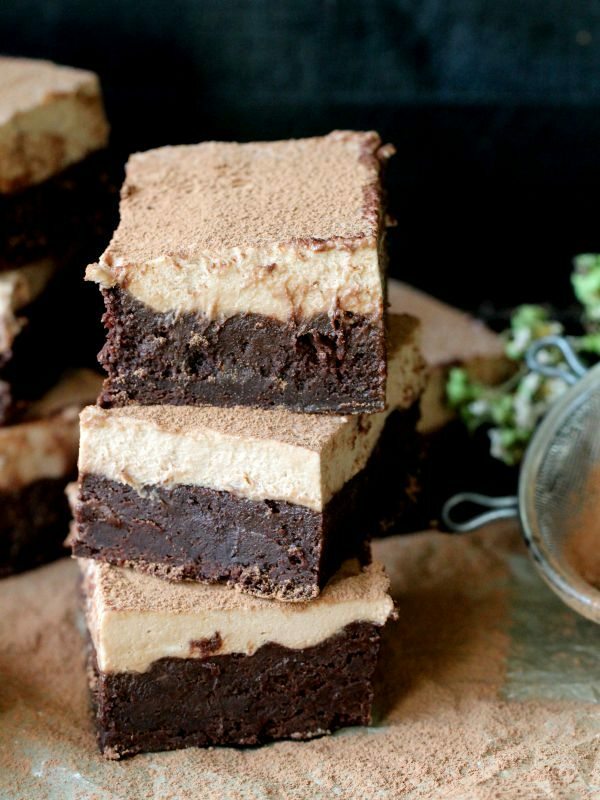 A delicious dessert, where cookie dough is baked on top of a brownie batter layer. How long does it take to bake Brookies? If you are using an 8×8 pan, it will take 35 to 40 minutes to bake it. You can serve the Brookies hot, topped with ice cream or at room temperature. Can you make Brookies in a muffin pan? Yes, you totally can! Just divide the batter evenly between the muffin tins and bake for 20 to 22 minutes or until a wooden pick inserted in centers comes out clean. Cool Brookies for 10 minutes in the muffin pan, then move the cups to a wire rack to cool completely. 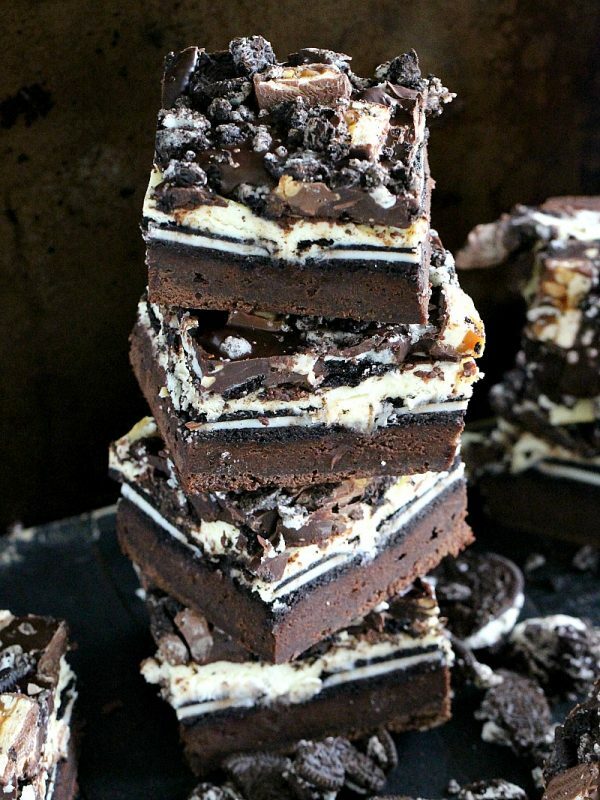 First you start with the brownie layer. Make sure you use high quality cocoa powder and good chocolate chips, as this is what will make your brownies taste outstanding. Once you have mixed all the ingredients for the brownie batter, set it aside or add it to the pan and start working on the chocolate chip batter. For the chocolate chip batter, I like to use a combination of white and brown sugar. The brown sugar is what will add depth of flavor to the cookies. Making sure that all the ingredients are at room temperature is also very important. Once the chocolate chip batter is ready, scoop it over the brownie batter and carefully spread it using a spatula. You can add extra chocolate chips of top, more chocolate never hurts! 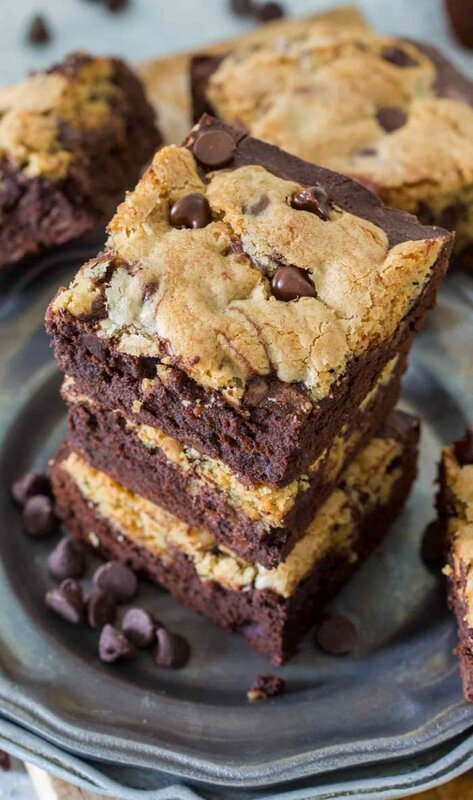 Brookies Bars are a delicious and sinful combination of gooey, chocolaty brownies topped with a buttery chocolate chip layer. Why give up, when you can enjoy both! 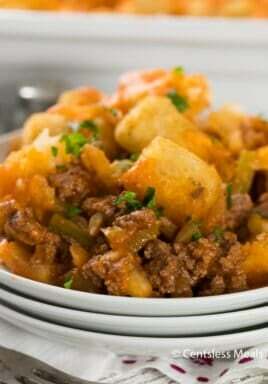 Line an 8 X 8 inch pan with parchment paper, spray with baking spray or grease with butter and set aside. In a large bowl cream together butter and both sugars until well combined, for about 2 minutes. Beat in eggs, one at a time, and add vanilla extract. Stir in cocoa powder until fully combined. Stir in flour and salt until well incorporated. In a large bowl cream together butter, brown sugar and white sugar until well combined, for 1-2 minutes. If needed, stop and scrape the sides of the bowl with a spatula. Stir in all purpose flour, baking soda and salt until well combined. Using a spatula, fold in 1 cup of chocolate chips. Set aside. Spread the brownie batter into the prepared pan into an even layer. Use a spatula to level it up. 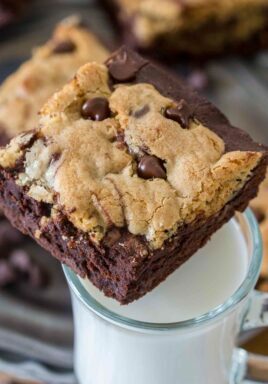 Using an ice cream scoop or small cookie scoop, drop the cookie dough batter by the spoonful over the brownie layer evenly. Use a spatula to spread it. Bake for 35-40 minutes. If you want the cookie layer to be slightly under-baked and chewy, remove from oven after 30 minutes. Remember that the Brookies will continue to cook as they cool in the pan, so be careful not to over bake. Check on them at the 30 minute mark. Remove from oven and place on a cooing rack to finish cooling. Stick the remaining 1/2 cup of chocolate chips into the hot cookie layer. These will make the Brookies prettier and also the chocolate chewier.